*March 2016 will see the reopening of IWM Duxford’s American Air Museum, after a major transformation and redevelopment. The transformed American Air Museum will tell the story of Anglo-American co-operation in twentieth and twenty-first century conflict, as seen through the eyes of the people intrinsically linked with the aircraft and objects on display. From Private to President, the American Air Museum will feature the personal stories of many people whose lives have been shaped by their experiences of conflict. Historic aircraft from the 1930s to the present day have been conserved and are dramatically displayed in the transformed American Air Museum. New technology has been used to create a continuously evolving and interactive record of the American Air Museum’s Roll of Honour, as a fitting tribute to the men and women who lost their lives fighting for world freedom from the East of England. The organiser of Folkestone Airshow 2014, Open Air Promotions Ltd, has named the RAF Benevolent Fund as official charity partner for the event. Director Yvonne Holder said that the organisation did wonderful work supporting serving and former RAF personnel and their families and it was fitting that it benefited from an event in which so many iconic military aircraft would take part. “Our donation will be a share of the money received from the sale of souvenir programmes. Cover price will be £3.50, of which 50p will be given to the Fund”. Paul Hewson, regional director of the RAF Benevolent Fund, said that the charity was ‘absolutely thrilled” to have been chosen as an official partner for what promised to be Folkestone’s biggest and best air show. “Few people realise the extent of the work we do. Every year, we spend more than £20 million on a wide range of support services and without the generous support of events like the Folkestone Air Show it simply would not be possible to provide them on the scale we do”. 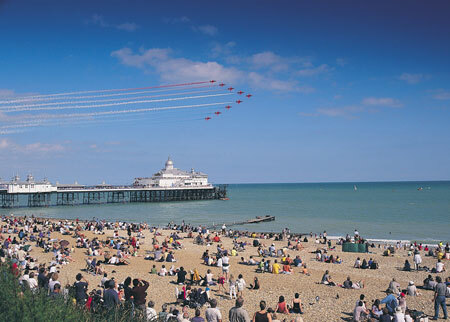 Folkestone Airshow takes place on Saturday and Sunday, June 7 and 8. The flying programme on the first day will feature the RAF Red Arrows aerobatic team. It is with great sadness, that I have to advise you that Folkestone Airshow on Saturday 8th June 2013, will not take place. After a very difficult few weeks, the hard decision has been taken to cancel Folkestone Airshow for a number of factors. The first being is the financial risk of putting on this major event is too great for Folkestone Town Centre Management Ltd, a not for profit organisation, to take, in these very difficult financial times. The second, as we were unable to confirm additional flying displays, due to financial constraints, the Shepway Safety Advisory Group were unable to assess the risks involved. We all agreed that there wasn’t enough time left for to provide the Shepway Safety Advisory Group with the complete Event Management Plan in order to satisfy them that the event could take place safely. I will continue to look into the financial viability of continuing the work already completed, to see if it is at all possible of postponing until 2014 and to carry forward the commitment of our sponsors and organisations who have supported Folkestone Airshow into 2014. Exciting plans for this summer’s RAF Cosford 75th Anniversary Air Show are firmly on track thanks to a partnership deal with Arriva Trains Wales. The Air Show has teamed up with the rail company once again to offer an easy-to-buy ticket that combines rail travel with entry to the West Midlands’ largest – and most thrilling – aviation event. The relationship between the two companies has existed for over 10 years to ensure visitors to the Air Show have the opportunity to indulge in a stress-free and cost-effective day out. Visitors can enjoy the advantages of a 20% discount off the on-the-day rate for standard admission as well as utilising dozens of rail links to the RAF Station. Furthermore, for the first time ever, tickets to the Air Show can be purchased from any staffed UK station or online. The Cosford railway station is within 120m of the Air Show pedestrian entrance so therefore provides people with a simple but effective way of getting to and from the 2013 event. The announcement follows a spate of exciting aircraft confirmations to this year’s show including the RAF Battle of Britain Memorial Flight and the RAF Red Arrows. In addition to the flying display, organisers have put significant effort in creating an attractive selection of events on the ground. Visitors can enjoy expanded interactive aircraft and military exhibits, arena demonstrations, a fair ground, as well as having the opportunity to shop for craft and memorabilia, enjoy fine refreshments or visit the RAF Museum Cosford and its famous Cold War exhibition. Last year more than 38,000 people attended the family day out and organisers are anticipating another bumper turn-out at the one-day event. Jonathan Goode, Special Events Manager for Arriva Trains Wales commented: “We are delighted to be involved yet again in this year’s RAF Cosford Air show and what promises to be a spectacular event. As always, all of our available carriages will be in use to transport visitors to the ground and we will be catering for approximately an additional 6,000 people. A rail service will be available from Cosford station to Shrewsbury and Wolverhampton and extra staff will be on hand at the station to assist passengers with their journey”. Arriva Trains Wales are offering these extra services in anticipation of increased numbers and will supplement their current Sunday timetable. Schedules will be revealed sooner to the event. If you wish to purchase your combined rail travel and admission tickets, or for more information, please visit www.arrivatrainswales.co.uk. Air show tickets can also be purchased online at www.cosfordairshow.co.uk or by calling the 24-hour ticket line on 0871 230 1083. Advance tickets are priced from £20, a 20% discount off tickets bought on the day (£25). There’s FREE car parking and FREE admission for children under-16s accompanied by an adult.